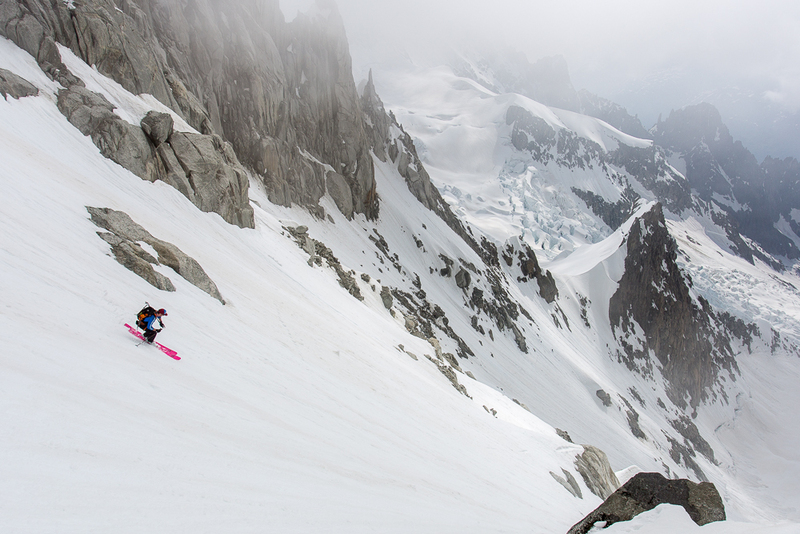 Mont Blanc’s wild and rugged south side is somewhere I’ve wanted to ski for a while. Whilst the normal ski route on its north side sees the passage of many hundreds of skiers each spring, most skiers stay away from its south side and the Brenva basin. Take a close look at the area and you can see why. 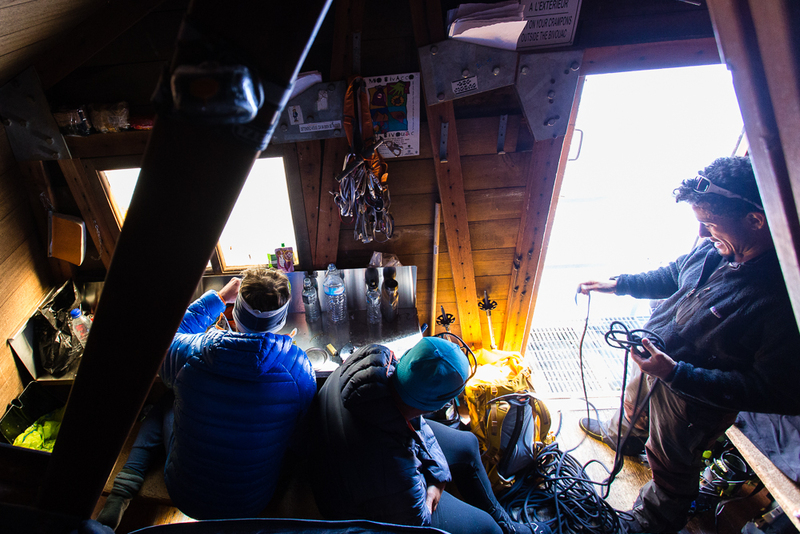 The terrain is steep, the exposure is high and the place is littered with unstable seracs. 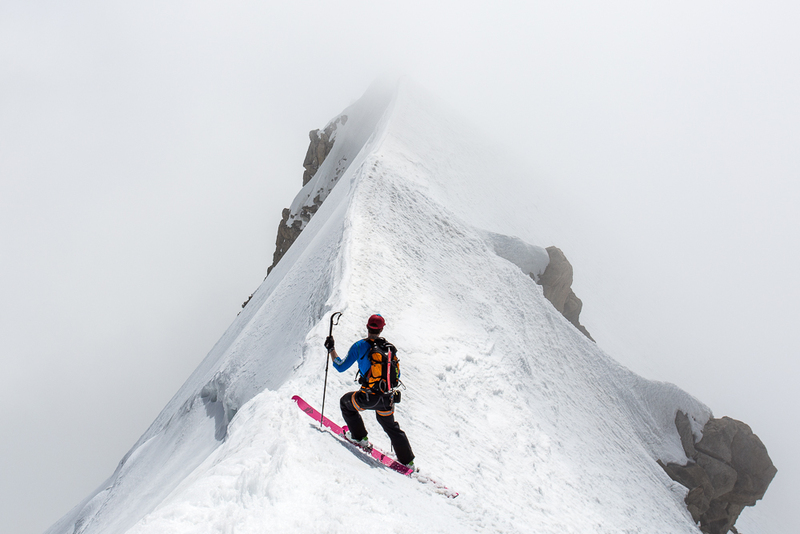 For these reasons many of the lines around the Brenva have seen only a handful of descents and some have never been repeated. The only line to see somewhat regular attempts is the Brenva Spur, the basin’s ‘easiest’ line and one that is comparatively safe. Captivated by the thought of skiing such an aesthetic line in a truly wild setting, last week Joel and I went up to give it a go. 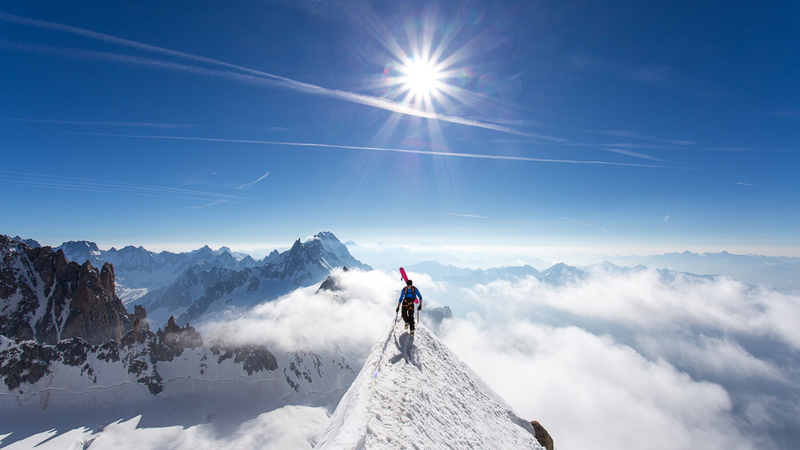 Mont Blanc’s Brenva basin. The Brenva Spur is the ridge line in the centre of the photo. 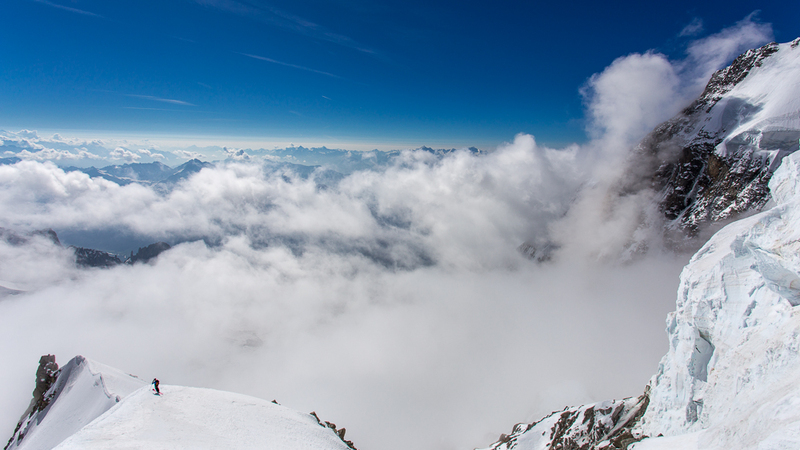 The ridge on the left is the famous Peuterey Arête, the longest ridge in the Alps. 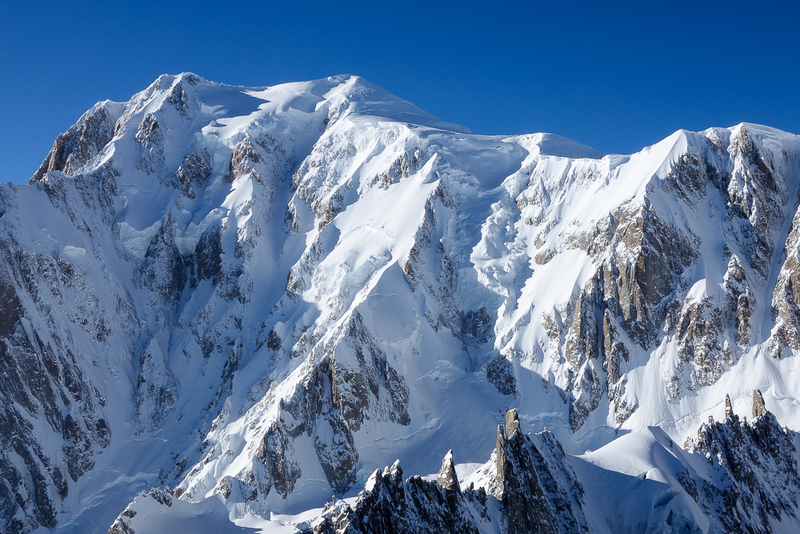 On the far left of the photo you can also see the north face of the Grand Pilier d’Angle which tops out on the Peuterey Arête. 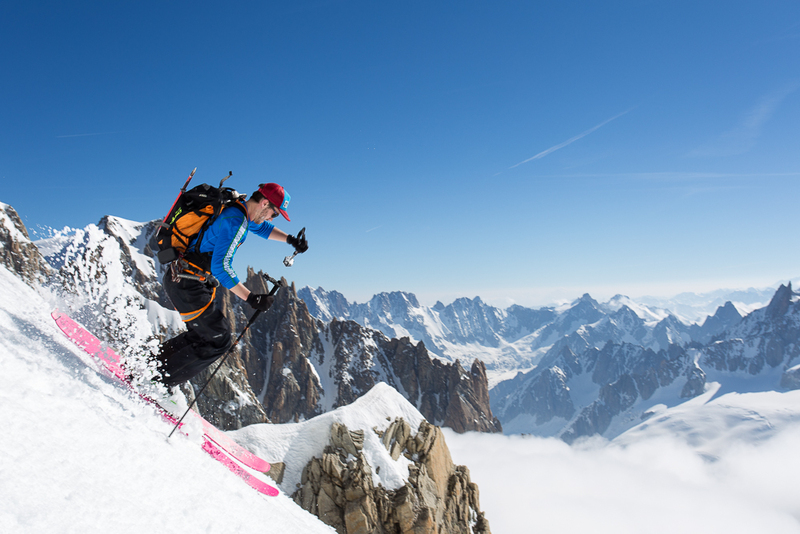 Home to many quality ice routes, the face was also skied by steep-skiing legend Pierre Tardivel in 1988, a descent that remains unrepeated. Given the easterly to southerly aspect of the Brenva basin, an early morning start is essential. This means heading up to the Fourche Bivouac the day before. The Bivouac comfortably sleeps 8 though you’ll often find double that number trying to squeeze in on summer weekends. 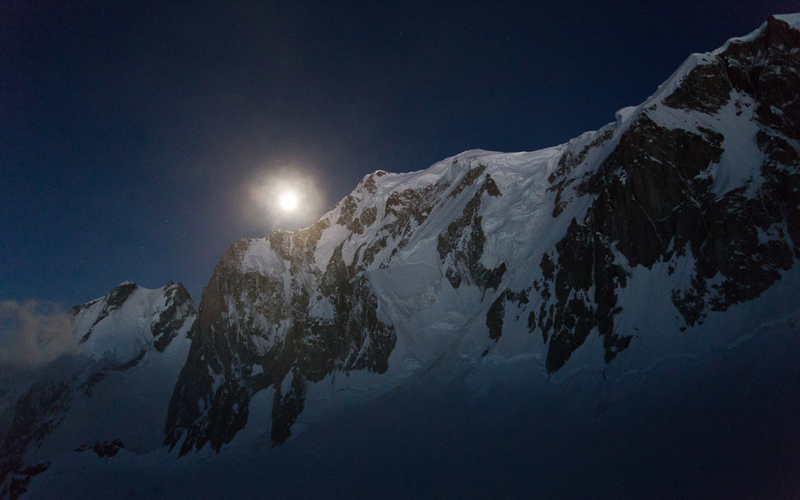 The Brenva Spur at night. Joel and I left the refuge before dawn. We hoped that an early start would see us up at the top of the route before the day became too hot. Unfortunately we didn’t get off to the best start. 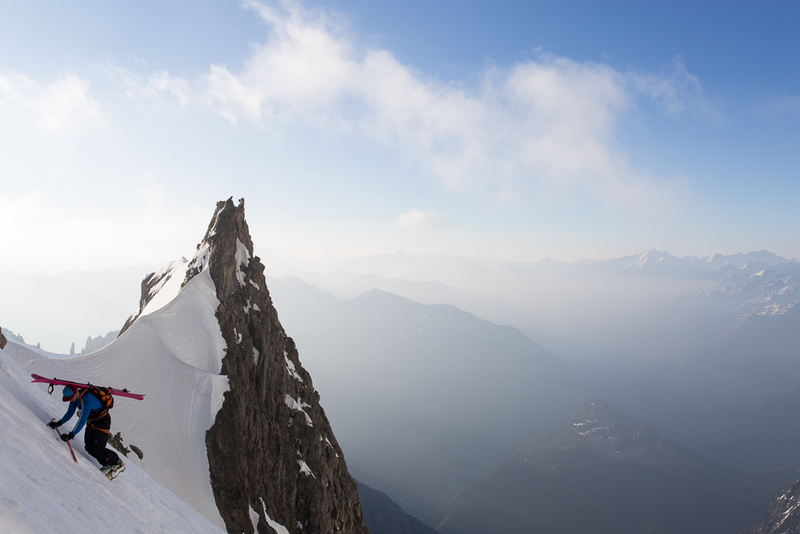 Chamonix was in the midst of a heatwave and the refreezing level was unseasonably high. This led to slushy snow at the base of the route which slowed us considerably. Joel’s face says it all! Not the firm snow we’d been hoping to find. Morale was a bit low at this point. Fortunately the snow conditions soon improved and we were able to make quicker progress up the spur. 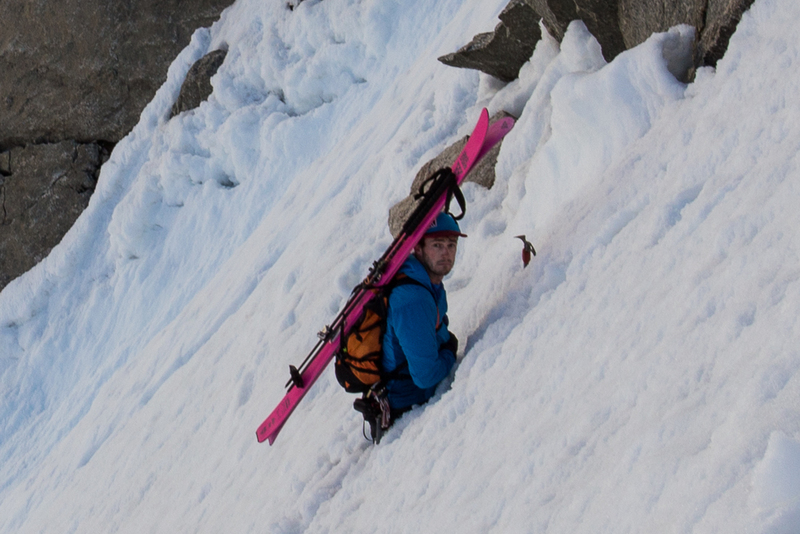 Joel approaching the upper section of the Brenva spur. Joel walking along the spur, a cloudy Italy behind him. As we climbed higher the snow frequently changed from firm to slushy. The slushy snow made for slow climbing and as we approached the upper section of the spur Joel and I both knew that time was not on our side. Getting to the top of the spur looked increasingly unlikely. If we pushed all the way to the top we risked letting the snow at the base of the spur become too warm, leading to increased rockfall and avalanche risk on the descent. We therefore decided to clip into our skis about 150m from the top. Though a shame to miss out on skiing the line in its entirety, any frustration soon washed away once we started skiing. The snow was excellent. 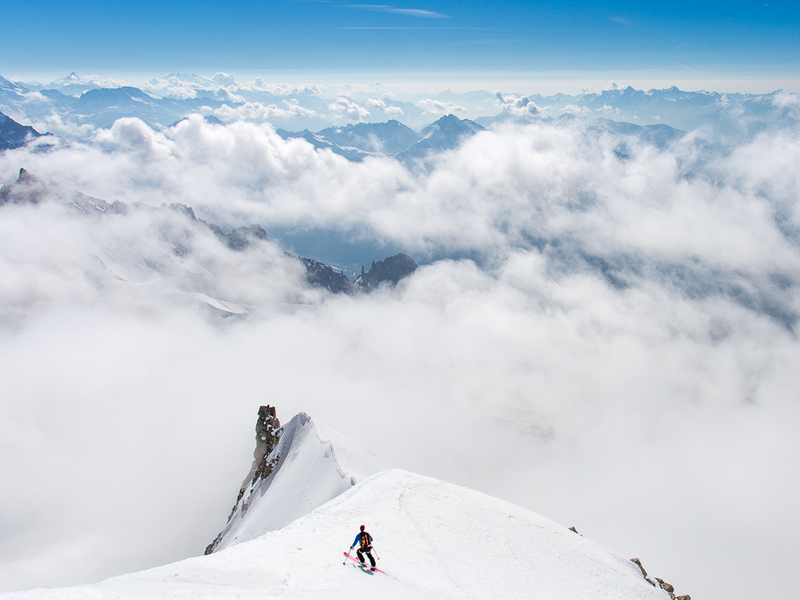 Making smooth linked turns on the 40-45 degree upper section as I dropped into a cloud-covered Italy ranks amongst my most memorable moments skiing. Joel makes his way down the spur. Left or right? As we lost height, we became engulfed in a sea of cloud that had been building during the morning. Joel about to drop in right. 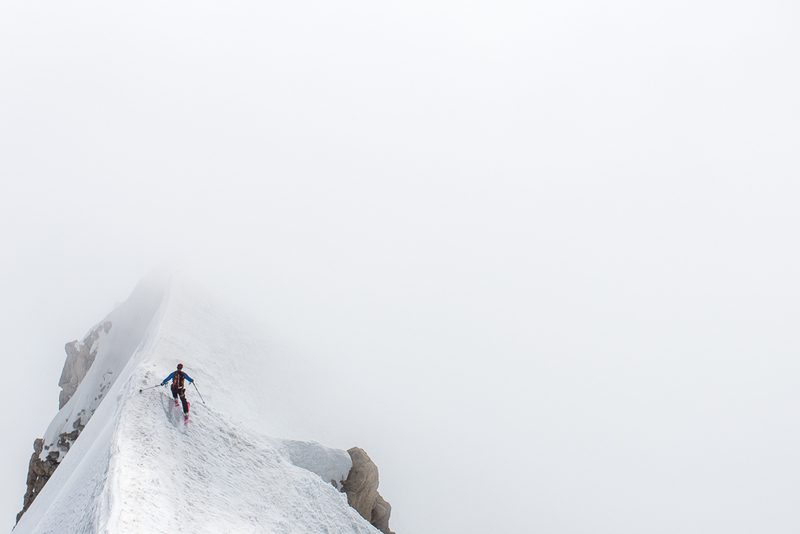 The subsequent 200m metres of skiing are the crux (mid to high 40s). 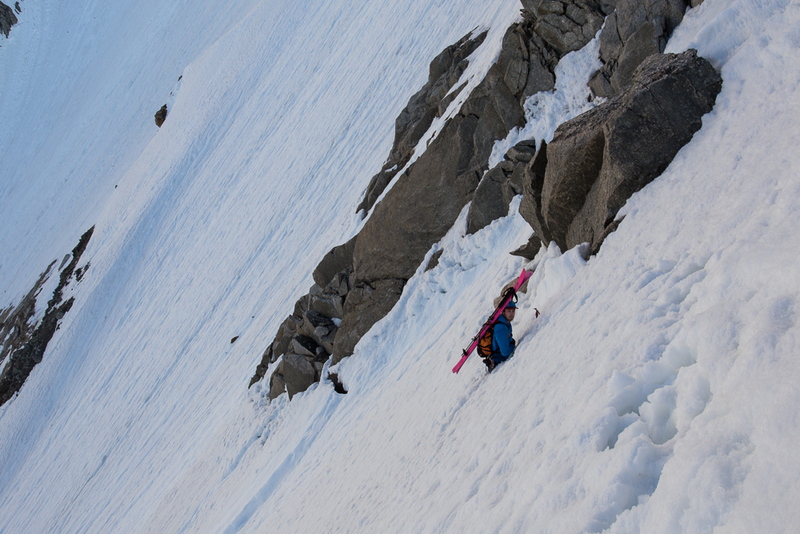 We were lucky to find slightly firm, but consistent grippy snow all the way down this section. This made for some really fun skiing. Joel emerges back out of the cloud on the lower section of the spur. A quick traverse over to Col Moore (the snowy col middle right) marks the end of the skiing and the start of a long slog back home. Now mid-June, our descent of the Brenva Spur may mark the end my ski season. If so, it was a pretty incredible way to end it. Fingers crossed next season will be just as good!